What it is: Aurora tote, a versatile and chic bag for on-the-go women. Initial Impressions: Boy, is it big! The Aurora tote’s generous size can either be a blessing or a curse. It easily fits a typical bag’s content: wallet, phone, keys—but wait, there’s room for so much more! Rushing out the door this morning, I was also able to stuff in my numerous recent impulse-buys: glue, scissors, and a scrapook binder. Passing the refrigerator, it came to me that last night’s leftovers would make for a yummy lunch; in goes the tupperware. Thoughts of eating prompted me to fetch my running shoes for a post-work run. Ack, and the photos I needed to edit? In, too, went my laptop (into its own separate, padded compartment). At this point, I’d thrown into the expansive bag everything but the kitchen sink. (It might have fit, too.) Is it far-fetched to claim this bag is making me overproductive? Pros: By unzipping the single zipper along its length, the tote literally triples in size from a slender laptop bag reminiscent of a document bag to a “catch all” the size of a rectangular briefcase. Cons: The double-stitching on the bag I reviewed is loose along one of the folds. By no means is the thread coming undone, however—it’s just strangely loose. Usefulness: 10/10. This is two bags in one as it transforms to fit the day’s needs. Portability: 8/10. Since it’s a tote, the bag is larger than most, but not excessively so due to its semi-rigid side panels to help the bag keep its shape. Value: 7/10. It may be a stretch to pay $150 for a tote, but not for two bags in one, as is the case with the Aurora. As another value proposition, the bag comes equipped with the knomo Tracker: an ID code specific to the bag (registration required) and a phone number so that the bag can find its way back to you (if a good samaritan finds it, that is). Durability: 7/10. As noted above, the bag’s threading may be at jeopardy. I own another knomo bag so can attest to the general durability of the company’s products, however. Cool Factor: 9/10. 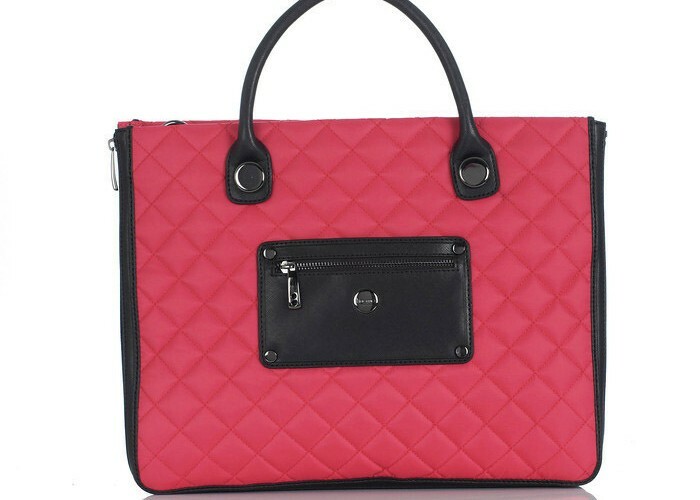 The tote offers a modern and chic look with vibrant colors and abundant size. The bag screams bold!